More and more often, global leaders are asking us the same simple, yet colossal, question: "Does anyone know for sure what the world is thinking?" There is a great deal of classic economic data that record an infinite amount of human transactions, from GDP to unemployment to birth and death rates, that indicate what man and woman are doing. But there is no ongoing, infinite, systematic account of what man and woman are thinking. Global leaders are right to wonder. To know what the whole world is thinking -- not just what people in their own countries are thinking -- on almost all issues all the time would certainly make their jobs a lot easier at the very least. At most, knowing what the world is thinking would create newfound precision in world leadership. Leaders wouldn't make mistakes and miss opportunities because they misjudge the hearts and minds of their constituencies and the other 6 billion with whom those constituencies interact. We think we have found a very good answer to that very good question. We created a new body of behavioral economic data for world leaders that represents the opinions of all 6 billion inhabitants, reported by country and almost all demographics and sociographics imaginable. We call it the World Poll. We've committed to doing it for 100 years. We knew going in it was a monumental challenge, but creating the World Poll was even harder than we thought. To start, Gallup scientists combed the best public opinion archives, academic institutions, the United Nations, the World Bank, the European Union archives, the State Department, everything and everywhere we thought we might find existing information of this type. We couldn't find it. There was no world poll. So we made one. We knew the whole project hung on the questionnaire. It needed to cover almost every issue in the world, be translated accurately into dozens of languages, and be meaningful in every culture. Even more difficult was engineering consistent sampling frames in more than 100 countries from Ecuador to Rwanda, Iran, Russia, Afghanistan, Ireland, Cuba, Lebanon, Kazakhstan, Venezuela, Honduras, China . . . You get the picture. Having constructed the questionnaire, our team of experts found its next biggest challenge was choosing a methodology to ensure consistent data collection so the whole set is comparable. For instance, when we ask about life satisfaction, everyone from a Manhattan socialite to a Masai mother has to be asked the same question every time in the same way with the same meaning and in their own languages so the answers could be statistically comparable. If the meaning of the questions isn't identical from language to language, culture to culture, year to year, the data are useless. Furthermore, we needed to create the first-ever reliable and consistent benchmarks so leaders can see the trends and patterns. So we benchmarked well-being, war and peace, law and order, hopes and dreams, healthcare, suffering and striving, personal economics, poverty, environmental issues, workplaces, and on and on. We have now completed the design, engineering, and first year of global data collection. The first-ever world poll on almost everything is done. Then our Gallup scientists, affiliated academics, and colleagues from around the world who helped us make the poll got busy. They counted and sorted and used every known statistical technique to analyze exactly what the world is thinking. The conclusions are complex. This may be the great understatement in Gallup's history, but it's true. For instance, when you dig deeply into the hopes, fears, motivations, and satisfactions of 1 billion Muslims, the more you learn, the more you realize how little the world knows, how wrong people are, and how much more complicated Muslim attitudes and opinions are than conventional wisdom would lead us to believe. Western leaders tell us religion drives Muslims to war. But Muslim extremists tell the World Poll that their anger is not about religion, it's about politics. It's the same with the 3 billion people who live on $2 a day or less -- the hungry half of the world's population. What they're thinking is very different from what most government agencies and NGOs understand and report. While we're rushing them food and medicine, most of them feel the only real solution is jobs. Another example: One of the most important questions in the world is "What do Muslim women want?" Discovering what Muslim women want has been as big a surprise to us as anything we have ever seen. Muslim women want all the freedoms that their counterparts in the Western world have -- they want the right to vote, to have the same rights that men do, and to hold leadership positions in government. The big surprise is that most Muslim men think Muslim women should have these too. And because women are half of the population, it's difficult to win in the new world unless they, their hopes and dreams, and their talents are integrated into the leadership of every organization, economy, and government in the world. And those are just three demographics. Christians, Jews, Buddhists, old people, young people, black people, white people, communists, capitalists, Easterners, Westerners . . . These data are overwhelming because, while they offer answers to many questions that could never be answered before, they make us intensely aware of how little we know about what is in the hearts and minds of 6 billion people. Gallup is committed to conducting the World Poll for 100 years, but we may have already found the single most searing, clarifying, helpful, world-altering fact. If used appropriately, it may change how every leader runs his or her country. But at the very least, it needs to be considered in every policy, every law, and every social initiative. All leaders -- policy and law makers, presidents and prime ministers, parents, judges, priests, pastors, imams, teachers, managers, and CEOs -- need to consider it every day in everything they do. That is one of the single biggest discoveries Gallup has ever made. It is as simple and as straightforward an explanation of the data as we can give. If you and I were walking down the street in Khartoum, Tehran, Berlin, Lima, Los Angeles, Baghdad, Kolkata, or Istanbul, we would discover that on most days, the single most dominant thought carried around in the heads of most people you and I see is "I want a good job." It is the new current state of mind, and it establishes our relationship with our city, our country, and the whole world around us. Humans used to desire love, money, food, shelter, safety, and/or peace more than anything else. The last 25 years have changed us. Now we want to have a good job. This changes everything for world leaders. Everything they do -- from waging war to building societies -- will need to be done within the new context of the human need for a "good job." How does this change everything? The leaders of countries and cities must make creating good jobs their No. 1 mission and primary purpose because securing good jobs is becoming the new currency for leadership. Everything leaders do must consider this new global state of mind, lest they put their cities and countries at risk. Leaders in education will be forced to think beyond core curricula and graduation rates. If you are a school superintendent or a university president, you'll need to recognize that students don't want to merely graduate -- their education will need to result in a "good job." Lawmakers need to contemplate whether and how new laws attract or repel a wide range of individual value systems. If enough people are sufficiently repelled, then the new laws will effectively strangle job creation. Military leaders must consider it when waging war and planning for peace. They must ask themselves whether military strikes, occupations, or community policing will effectively build a growing economy with good jobs. The opportunity to have a good job is essential to changing a population's desperate, and violent, state of mind. The mayors and city fathers of every city, town, and village on Earth must realize that every decision they make should consider the impact, first and foremost, on good jobs. The evolution of the great global dream is going to be the material of a million Ph.D. dissertations. But it's only the beginning of the story. The shift in importance to "a good job" leads to a significant change in the evolution of civilization. There are endless indicators, but the most evident change is in global migration patterns. Man and woman probably appeared about 200,000 years ago on the savannah plains in what is now known as Ethiopia and fanned out across the Earth to improve their lives, their tribes, and their families. We have never stopped walking. The first to move have always been the boldest adventurers, explorers, and wanderers, and that's still true. Until rather recently in human evolution, the explorers were looking for new hunting grounds, cropland, territories, passageways, and natural resources. But now, the explorers are seeking something else. Today's explorers migrate to the cities that are most likely to maximize innovation and entrepreneurial talents and skills. Wherever they can freely migrate is where the next economic empires will rise. San Francisco, Mumbai, and Dublin have become hotbeds of job creation. This phenomenon has occurred in other hot cities from Austin to Boston and Seoul to Singapore. Highly talented explorers with the best skills and the most knowledge are attracted to the best cities. When they choose your city, you attain the new Holy Grail of global leadership -- brain gain. Brain gain is defined as a city's or country's attraction of talented people whose exceptional gifts and knowledge create new business and new jobs and increase that city's or country's economy. To some degree, all cities of all sizes, everywhere in the world, have a success story of brain gain. Someone had a good idea, and its implementation created new jobs in that town. Brain gain is the big-bang theory of economic development. The challenge leaders face is how to trigger brain gain in their cities. It's a new challenge, but an old issue. Twenty-five years ago, virtually every economist, liberal and conservative, forecast that the GDP of the United States would lose its first-place ranking and drop to third. News shows, newspapers, and business magazines predicted that Japan's GDP would be around $5 trillion, Germany's would be around $4 trillion, and the United States would fall to third at about $3.5 trillion by 2007. The economists were partly right. Japan is at about $4.5 trillion, and Germany's at about $4 trillion too. But they couldn't have been more wrong about the United States. The country's GDP didn't fall. Over the last 25 years, it grew to $13 trillion. The best economists in the world were off by more than $10 trillion. They were wrong because their economic models didn't include the most powerful variable of all: the migration patterns of the most talented people. Value is now created from piles of ideas and determination, not piles of materials and natural resources. The economists underestimated the massive force of innovation and entrepreneurship that led to a technology revolution. Now global economists are saying that by 2040 or sooner, the U.S. GDP will fall to second, behind China. Their formulas assume that everything is linear or cyclical and that man is rational. China has more consumers and more low-wage producers, so logic dictates that China's economy will be an unstoppable juggernaut. That logic is likely to be just as colossally wrong this time because it doesn't consider where the next big build-out of innovation and entrepreneurship will occur. It doesn't consider brain gain or the migration patterns of talent. It could, however, be colossally right -- but only if China becomes a center of innovation and enterprise, attracting and retaining highly talented people. So, how many talented rainmakers would you need to change the GDP of one city and then one country? Researchers counted how many people created the technology build-out that led to the $10 trillion of unplanned revenue growth over the last 25 years in the United States. It appears to be about 1,000 people. Just 1,000 unusual star innovators and rainmakers. Some of those innovators, like Vinton Cerf, one of the founding fathers of the Internet, had a brilliant idea that others shared with the world. Some, like Meg Whitman, put together a brilliant team and business model that propelled the innovation. But if you only count the "stars," the key individual pioneers who initiated the single spark that ignited the breakthrough idea or company, you won't get much beyond 1,000. And of that 1,000, more than half were Americans who had migrated from other countries. However, the inherent problem in looking for only the 1,000 Americans who created the unforecasted $10 trillion is that it overlooks too many lesser, but equally necessary, individuals -- the great team members who supported the stars. Take Microsoft, for instance. We consider Bill Gates to be the poster child for this colossal economic engine, but Paul Allen, Steven Balmer, Jeff Raikes, and others played key roles. There would probably be no Microsoft if it hadn't been for them. The same is true for all world-class economic achievements and small and medium-sized ones as well. There is a star inventor and/or enterpriser whom we credit with the innovation, but we often forget the innovator's good fortune to have had several stellar performers or Super Mentors in his or her universe. Let me quickly review what exactly makes a star different from a typical, hardworking employee. A star creates large amounts of new human energy where none previously existed. That energy creates economic energy. The star's organization is the first and greatest beneficiary, but the organization sends the current out in the form of higher wages and more purchases. Its employees and suppliers earn more so they spend more money on things -- cars and houses and computers, healthcare, movie tickets, groceries, and of course, taxes. The energy weakens as it spreads, which is why Bill Gates hasn't made everyone in the world a millionaire, but the energy is nonetheless transmitted bit by bit throughout the star's organization, city, and country. The star's energy may be so strong it transmits all over the world. Proximity counts because the closer you are to the stars, the stronger the money currents are. These enterprisers are not limited to business. One guy in a Midwestern U.S. city has built a $100,000,000 junior college from nothing, and it's thriving and growing. His great value to his city and the United States is not just creating educated workers for the labor force, but also in the creation of many new teaching, administrative, support, and technical jobs. Of course, he has also purchased and developed real estate, requiring the services and supplies of dozens and dozens of businesses of all types. This social entrepreneur has created $100,000,000 of energy out of nowhere. And his Midwestern city -- and the rest of the country -- is benefiting. These stars juice their immediate economy and that of everything around them. They are drivers of GDP. Brain gain contributes to a country's GDP growth. A country grows one city at a time. A city grows one organization at a time. An organization grows one star at a time. And all organizations are economic engines for all cities. But who are these stars? They could live almost anywhere. More often than not, they are single, young -- between the ages of 25 and 35 -- and have at least an undergraduate college degree. And most of them have not yet been discovered nor have they created their big invention or enterprise. Therein lies the opportunity. If 1,000 world-class explorers and inventors were the heroes of the unforecasted $10 trillion, how many stars are there in the world? How many exceptional people should we be watching and tracking? How many are in your city, and what effect are they having on brain gain/brain drain? Because you want and need them all . . . the small, medium, and large stars. This math and interpolation are really rough approximations, but hopefully more precise than the calculations that mispredicted the U.S. GDP by $10 trillion. If 1,000 individuals were the "Columbus-type" explorers who receive all the credit for the economic value they discovered and claimed, let's generously assume that they had 10 other world-class supporting cast members around them -- 10 people who were so important that there would be no economic miracle without them. So that equals 10,000. We then multiplied the 10,000 builders of big businesses by 10 again to determine a rough gauge of how many inventors and rainmakers it takes to support the continuing growth of the total U.S. GDP. Ten thousand multiplied by 10 (to take into account and give credit to the dominance of jobs in small to medium-sized corporations, which make up about 70% of the U.S. workforce) equals 100,000. In other words, a mere 100,000 stars of varying sizes created the unforecasted current state of growth of the United States, a country of 300,000,000 people. Here's the part that matters to leaders: These 100,000 stars would have created that growth wherever they resided. If they had all set up shop in Sioux Falls, Kansas City, and Fargo, it would have all happened in the American Midwest. If this group had all lived in Sao Paulo, Rio de Janeiro, or Brasilia, $10 trillion would have magically appeared in Brazil. The math is simple. One star per $100 million of GDP growth. If you were to ask how to significantly increase your city's GDP, we would say you need to find and develop 10 stars. And you should create the biggest incubator of talent possible. Your incubator is your energy and job pipeline for the future. It will take some time to see the outcomes you want, but you won't get them if you don't start with 10 stars. The only other alternative is to buy growth, like companies do, with acquisitions. Corporate leaders face the organic vs. acquisition growth issue all the time, and they know that organic growth is the best long-term strategy for any organization or community of people. To get a better idea of how to identify and incubate the stars, our team coded the characteristics of several hundred extraordinarily successful business, political, and nonprofit leaders. Only four categories or codes were needed to classify them all. Innovators get ideas that create new products, new markets, stock value, and hatch thousands of jobs. They are often struck with their discovery while employed by an organization -- a hospital, the government, a corporation -- or most often during their university studies. They are as likely, however, to follow through on their discovery outside that organization as within it. In any case, the discovery creates the next big surge of energy for increased economic activity and subsequent job hatching. What makes Innovators stars isn't just their creative capacity, but also their rare talent to seek innovation in all aspects of their lives. Brilliant ideas are often born from seeking solutions to difficult problems, and Innovators are able to solve the problems and realize the idea. However, they aren't necessarily the ones who bring it to market. Entrepreneurs are most recognizable as super-salespeople or rainmakers. Entrepreneurs are those who see an idea, recognize the potential, figure out the necessary steps for making the idea a reality, and then bring the Innovator together with supporters to form a new venture. Entrepreneurs bet their money or career on a new idea, whether it's a new business or a new initiative within an organization. Entrepreneurs have the rare gifts of optimism and determination, which are, and probably will remain, the new most valuable resources in the world. Optimism and determination are more valuable in the equation than creativity and innovation because they are rarer. It's important also to recognize "social entrepreneurs" in this category, as they are just as crucial to building hot, growing cities. Social entrepreneurs provide surges of positive energy through philanthropies. The work these entrepreneurs do enhances the culture of their city and always increases the well-being of their communities. These social enterprisers not only create better cities, their organizations are economic engines and job-hatching machines. Superstars are extremely rare creative achievers, people unusually gifted in the arts, entertainment, or sports. They're famous authors, singers and other musicians, artists, chefs, architects, actors, fashion designers, politicians, soccer and basketball players, etc. Such celebrities need their own category because they are valuable magnets for the cities where they live and work, but mostly because they're economic engines themselves. They create huge new amounts of economic energy from their movies, books, concerts, sports championships -- the things they do, the related businesses that promote them, the causes they support, and on and on. Innovators, Entrepreneurs, and Superstars rely, whether they know it or not, on genius developers. We call such developers Super Mentors. They are the people who say, "Your idea could become a company. I'll line up investors for you." Or, "We need to get behind that professor's idea. He needs a lab here in town." Or, "Let's start a youth program that's the best in the country." There are several varieties of Super Mentors. Often they are "city fathers," rich businesspeople who care deeply about their city. They can be great college presidents or the heads of philanthropies or religious leaders or CEOs. Sometimes they're just average citizens with a deep commitment to the place where they live and the ability to find and encourage raw talent. In any case, Super Mentors have a gift for identifying and developing young stars and strong hands to guide and lead them. Super Mentors also have the rare capacity to command broad support and participation in local initiatives that otherwise wouldn't happen. The best and fastest growing cities in the world have an informal, never-elected group of Super Mentors. They work outside the local government and meet regularly to determine activities and strategies to help their city and people win. One could argue that this group of Super Mentors makes a bigger and more positive impact on cities than do local governments. They have as much or more access to money and influence within the community as government leaders do, and they have the great advantage of speed and fewer barriers. And they serve a critical function -- they are the very kindling that starts the fires of Innovators and Entrepreneurs. Talented people create brain gain. Brain gain and brain drain are among the most crucial factors for the growth and well-being of any organization -- from a one-employee business to the most powerful government on Earth. The most important issue for leaders is to identify and cultivate the conditions that create brain gain. They have to know the key factors. We ask 100 core questions in our standard World Poll survey regarding seven critical conditions of life -- conditions that are present in every country. When any of these conditions are higher or have momentum, it is likely that brain gain and GDP are higher. The seven critical conditions cover law and order, food and shelter, work, economics, health, well-being, and citizen engagement. There are several question items per each condition. For instance, "Do you feel safe walking alone at night in your community?" is one of four questions that measure the human condition of law and order. At the other end of the behavioral economic algorithm is "Have you volunteered your time to an organization …" which factors into the condition of citizen engagement. Each domain is never static; things are always getting a little better or a little worse. Because they are not static, they can't be "resolved" -- cities and countries must improve them continuously. Furthermore, we found that there is an order of importance to the issues, and that the higher the scores on these issues, the greater the potential for higher brain gain and GDP. A leader's biggest challenge is creating momentum on any of these critical domains. Law and Order. The presence of law and order is the first and most important manageable condition. Take Sierra Leone, for instance. Nearly half of Sierra Leoneans say they have had money stolen in the past year, and nearly 3 in 10 say they have been mugged or beaten. These figures are among the highest we've found so far. Without law and order, Sierra Leoneans will be severely hindered as they rebuild their country after a violent, decade-long civil war. When law and order improves in Sierra Leone, so will GDP and life expectancy -- currently age 40. Food and Shelter. This is the same basic need Abraham Maslow identified 50 years ago. But as important as it is, we found it to be No. 2 on the new scale of well-being -- as we saw in the "law and order" example, one's ability to obtain food and shelter may depend on law and order and is also highly related to life expectancy in lower income countries. In the United States, 10% say there have been times when they haven't had enough money to provide adequate shelter for their families in the past year, and 17% say they didn't have enough money for food. Those numbers are 36% and 27% in Russia. Consider the difference in each country's GDP. But in both cases, if this condition improves, brain gain and GDP will increase. Work. As Freud said, "Love and work are the cornerstones of our humanness." Work is crucial to every adult human because work holds within it the soul of the relationship of one citizen to one government and one country. The most important World Poll discovery, so far, is that the primary driver of almost everyone is a "good job." This particular condition relates to net migration in high-income countries and GDP growth in low-income countries, but it is also a core influence of elections, revolution, and war. While food and shelter and law and order are basic needs and are associated with self-preservation, work is where well-being turns the corner. This is where positive emotions that lead to creativity and openness are built. Good work facilitates a higher standard of living, higher potential for health, and higher well-being. Economics. When perceptions of economic confidence have positive or negative momentum, it may potentially affect local economics and GDP. If an Innovator doubts the vitality of his personal, local, or national economic situation, he'll believe that Super Mentors won't come to his aid, or that the government restrictions are too onerous, or that his customer base is too narrow and always will be, and he'll never implement the idea. And a potential star fades, as does a potential spike in the GDP. Health. This condition tracks specific health problems. We ask the whole world "Do you have health problems that prevent you from doing any of the things people your age normally can do?" Condition-specific questions range from the presence of physical pain and sleeplessness to whether one smokes and exercises and satisfaction with personal health. Health highly correlates to well-being in low-income and middle-income countries. Healthy people create more vibrant communities and more productive workplaces, which contribute to productivity, brain gain, and quality GDP growth. Well-Being. While the health domain reports perceived physical and mental health, well-being reports the presence of suffering or thriving, misery or inspiration, feeling controlled or feeling independent. This is a crucial metric because all good things happen in the presence of high well-being. Many world leaders argue that the ultimate act of leadership is to improve gross well-being (GWB) versus increasing gross domestic product (GDP). Maybe. In any case, this "soft" issue affects a population's ability to innovate, improve, and invent, because it reports the all-important presence of hope. Engaged Citizens. Citizen engagement is the actualization of real global altruism. This is the domain of world-class social entrepreneurs. It is the ultimate act of all leaders of all ranks because this is how leadership touches absolutely every constituency in the community. Citizen engagement is the Mother Teresa domain of the World Path because it explains charitable giving not only of money, but also of time, and willingness to help strangers in need. It's the most precious and sophisticated value, and it speaks to the genius of Super Mentors. And it has the biggest potential returns of all for brain gain and subsequent GDP, especially in higher income countries. Citizen engagement creates two kinds of magic. It generates new multiples of relationships between wide ranges of citizens, which breeds cooperation, productivity, citizenship, and patriotism. Positivity about one's country, and more particularly, one's community, creates an environment that makes talented people want to come and stay. From the very beginning of our 70 years of observing and studying the practice of leadership, we've known that unless a city or country has several committed, admired, and talented leaders in place, growth won't occur. The Gallup Path behavioral economic model for societies assumes that the primary purpose of all "new world" leadership is to create an environment in which talented people want to live and work. This new global leadership responsibility rises above every other duty. Attracting, retaining, and developing talent in your organization, city, and country is now a more important variable than natural resources, ports, and even direct investment. An effective global leader must see the task not as "fixing the problem" because brain-drain problems are almost always too complex to quickly fix. Rather, leaders must get the solution headed in the right direction. The job of leaders is to use strong hands to yank their organizations, their cities, and their countries onto the right path. A successful team of global leaders will need both state-of-the-art classic economics, such as GDP, inflation, population, and birth rates and state-of-the-art behavioral economics, such as law and order, citizen engagement, and well-being to affect the migration patterns of the most talented people and create the next global economic empire. Globalization has inspired this fascinating turn of events: The type of management science usually reserved for large, multinational companies is starting to be applied to small businesses in Mexico -- and it's boosting bottom lines. Find out how. 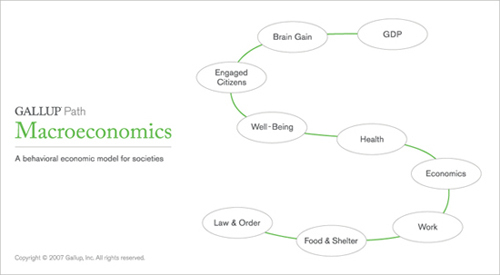 Gallup examined forward-looking metrics encompassing economic, workplace, community, and personal choice factors that might predict future livability. The result: We found the region that will be the most livable in 20 years.